Sussex Neighbourhood House is very pleased to have been selected to exhibit in the MoreArt Public Art Show in 2012 with our project ‘A Neighbourhood Holding Space’ which you, the community, are invited to create. Our site is in the former vendor window at Gowrie train station. Arts-making community gathering: Creating a Holding Space to Tell your Story : Sunday 16 September, 12.30pm to 3.30pm. 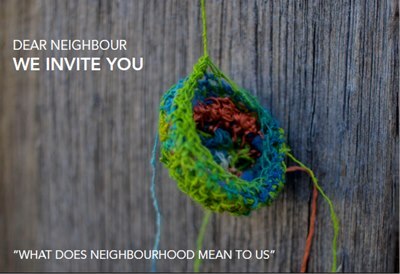 The first gathering explores the question “What does neighbourhood mean to you?” and introduces participants to the artistic form of Holding Spaces and invites you to create your own. The individual Holding Spaces will form our collaborative, group exhibition piece. Arts-forming community gathering: Bringing the Individual Art Works Together : Saturday 22 September, 12.30pm to 3.30pm. The second gathering focuses on ‘bringing together’ for installation and as a group will look for similarities and differences in the individual Holding Spaces and stories.